I have previously drawn attention to the various novel ways that my name has been represented, usually by organisations that appear to have software programmes that cannot cope with my name. I am used to Lord N. O. Louth, Lord Louth, LNO Louth and variations thereon. 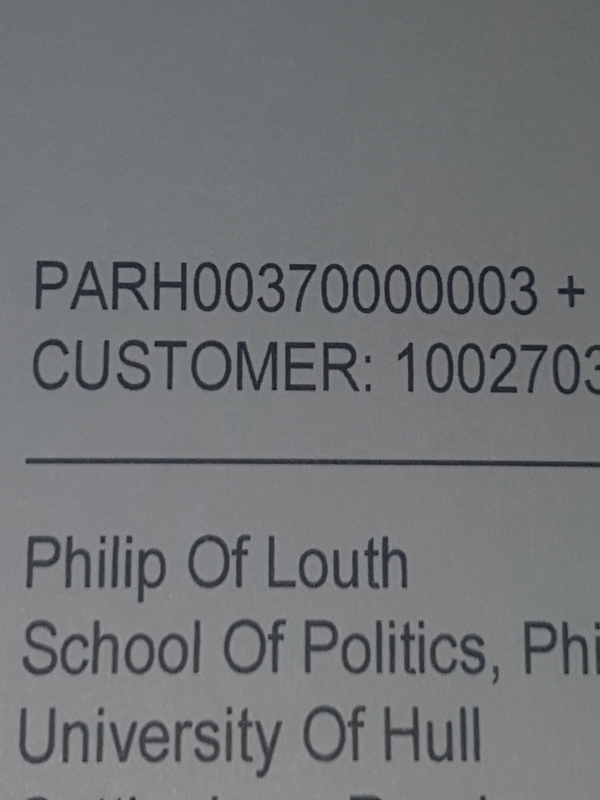 I recently tweeted that I had received a journal renewal notice addressed to ‘Philip of Louth’. The journal has now arrived, addressed (left) as per the invoice. I have tweeted that the designation makes me sound like a medieval monk. I don’t intend to become a hermit quite yet. Still, could be interesting for students when asked who they have been taught by. This entry was posted in Uncategorized and tagged names, Philip of Louth. Bookmark the permalink. Philip of Louth made me think more of a ‘Greek Philosopher’ than monk (though maybe you were thinking of William of Ockham). Now the ‘Venerable Philip’ and you have to live in Jarrow (which makes Hull seem like the Costa Blanca!